On Transport | We get around. What is “safe” to CBS New York? From the TV station that presents pedestrian islands as safety hazards for cars, a screenshot presented without comment. 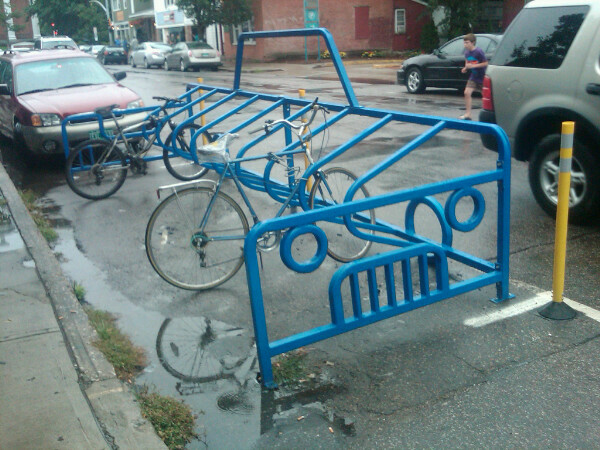 Over the weekend, I came across this clever re-use of a car parking space for bike parking in Burlington, Vermont. It’s remarkable that in a town where cars are the primary mode of transportation, this can happen, but in New York City, it’s marked with political controversy and delays. What’s wrong with this picture from the corner of 1st Avenue and 16th Street in Manhattan? Too many things to even begin. For one, a van is blocking a crosswalk by parking the zebra stripes along the parking buffer of the First Avenue bike lane. 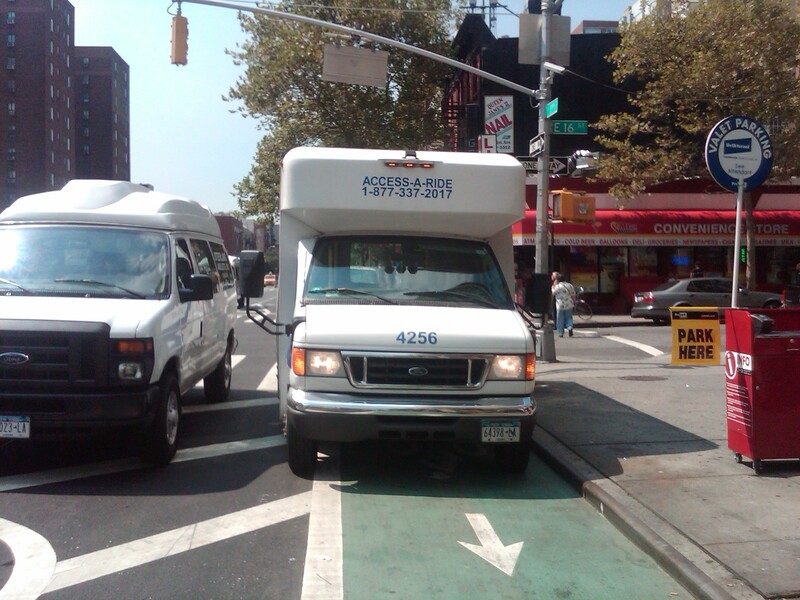 Second, and most obviously, is the Access-A-Ride van that is not only parked in the bike lane with the motor running, but parked in such a manner that the only way for it to leave the bike lane is to drive in the bike lane for an entire block. Third, but most troubling, is the fact that Beth Israel Hospital encourages people to drop off their vehicles for valet parking by stopping in the bike lane. I like these lanes, and I get angry when people abuse them. But I honestly can’t blame these people for doing such stupid things. I blame the NYCDOT and the NYPD. The assumption made by the NYCDOT when they place these lanes – which only exist in one other place in the city – is that once the paint is dry, people will figure out what to do. Cyclists will figure out how to use these lanes. Drivers will heed the “yield” signs and markings and watch for cyclists when making left turns. Drivers will figure out to use the zebra stripes and floating lanes to load and unload. And businesses will change their policies to adapt to the new configuration. But the NYCDOT doesn’t provide any education at all. There’s no awareness campaign with flyers or temporary signs to explain the changes. They simply expect everyone to figure out how to use them. And even a month after these lanes opened, it’s clear that plenty of people still haven’t figured out how to use them on their own. And the NYPD isn’t enforcing the rules, either. Do they even understand how this configuration is supposed to work? When someone is parked curbside in the left turn lane, are they blocking the bike lane? When someone is unloading a truck in the zebra stripes, are they parked illegally? The issue is murky, so their solution appears to be not to enforce any law on the lanes. If nobody gets ticketed, or even a warning, for parking in the middle of a bike lane, how is the lane going to be functional? The same holds true for double-parkers in unprotected bike lanes all over New York, but parking in a lane that is very clearly not meant for cars is particularly egregious. Yet there’s no negative reinforcement to this bad behavior. In the meantime, the First Avenue lane remains lawless mayhem. Without a little bit of education and enforcement, this non-intuitive layout isn’t significantly better or safer than any other bike lane configuration in New York City. I guess they left out the part where the truck driver swerves when startled by the car that’s cutting him off, causing a four-car accident. Or the part where the driver gets pulled over by a cop. Coincidentally, this ad followed a report on NY1 about how new bike lanes were going to make 1st Avenue in Manatthan dangerous. Seriously? Bikes are making our streets dangerous? 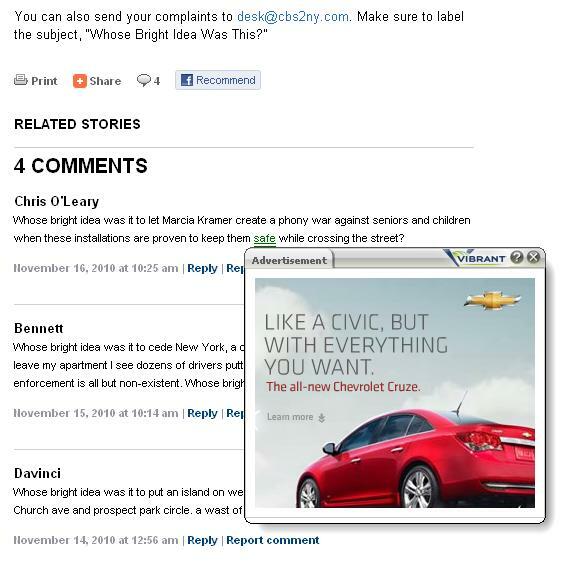 Update, 7/29/10: As commenter Nicole pointed out, Volkswagen removed this ad from their YouTube page just a day after I posted it. Dozens of comments below the spot on YouTube complained that it encouraged reckless driving, and a campaign by truckers may have also led to its removal. Above is an alternate cut of the ad used by a local dealership in Pennsylvania. Hopefully, VW is pulling the ad from TV, too, for the same reason. 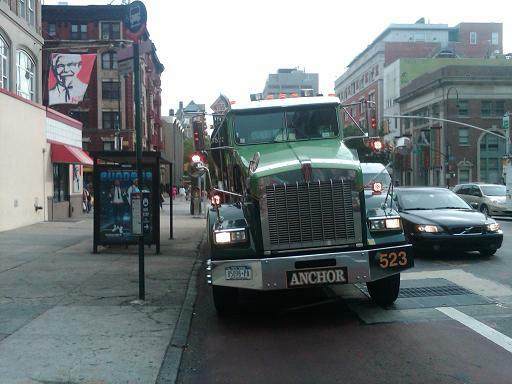 A truck from Anchor Tank Lines parks in New York City’s Second Avenue bus lane at the 14th & 2nd bus stop at 8:30am this morning, at the height of rush hour. Two M15 buses – on one of the busiest bus routes in the United States – were forced to stop in the street to load and discharge passengers, at the inconvenience of riders and other drivers. 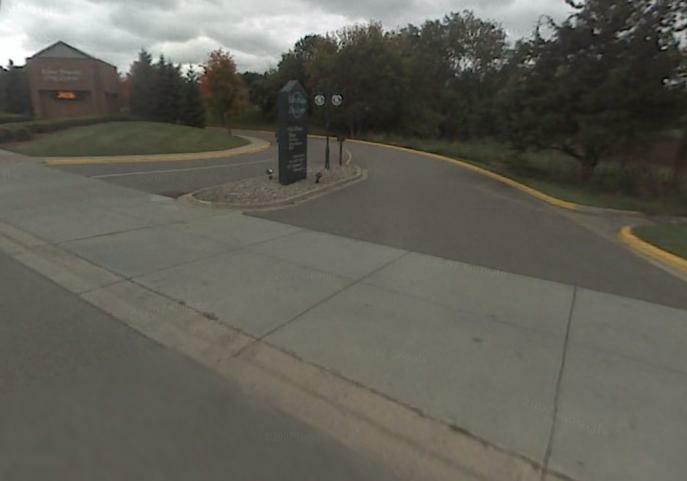 This is the front of the city hall in Eden Prairie, Minnesota, Money Magazine’s “Best Place to Live” in 2010. Rather, this is the entrance to the massive parking lot that surrounds the city hall. There’s no town square, no park, and not a single business within walking distance of city hall. There’s only one sidewalk to access city hall by foot, on one side of the street (and in the picture, the sidewalk is blocked with a “sidewalk closed” sign further up the road at the corner). It sits next to a rentention pond that appears to have been created to collect the runoff for the huge parking lot. The building is a low-rise, two-story building that appears to be the length of about three football fields. The building has no true front door, but rather several entrances that keep its citizens from having to traverse an entire parking lot just to get in. Money stated in its description of Eden Prairie that it “doesn’t have much of a downtown.” That’s a lie; it literally has no downtown at all. The entire town is made up of suburban sprawl, office parks, strip malls, and a big hulking indoor retail monstrosity known as Eden Prairie Plaza surrounded by acres of parking without a tree in sight. There is no sense of place in Eden Prairie. How, then, can it be one of the best places to live? Obviously, there’s also no prairie in Eden Prairie. Isn’t this part of a joke? It’s like when someone says that developers of sprawl cut down trees and then name streets after them. To be fair, much more walkable cities like Newton, MA and Fort Collins, CO also cracked the top ten. But if this anti-social, obesity-inducing, sprawl-choking town is what Money thinks is the best place to live in the United States, Money has a really warped sense of what makes a place great. While Streetsblog is decidedly up in arms over the journalism atrocities practiced by WCBS-TV’s Marcia Kramer, WPIX – who has a track record of drumming up anti-MTA sentiment through its reporting – quietly ran an “exclusive” story last night about MTA waste. The story accuses the MTA of “wasting” $10,000 a year on newspaper subscriptions for two top executives, their head of media relations, their spokesman, and the agency’s law library. Citing that the newspapers are available “for free online,” reporter Greg Mocker makes it abundantly clear that he thinks the MTA doesn’t need these subscriptions. Putting aside the fact that two of the newspapers the MTA receives have web sites that are behind paywalls (the Wall Street Journal and Newsday), Mocker ignores his journalism background and basic knowledge of how public relations works to do a smarmy, sarcastic journalistic hit-job on the MTA. For one thing, a lot is said about the MTA each day. They need newspaper subscriptions to monitor those stories. It is the responsibility of the media relations team and spokesman to monitor news stories about the MTA and respond when necessary. Heck, Greg Mocker himself had to reach out to the very people who receive these subscriptions. He works in journalism (or a sorry excuse for it, at least). Shouldn’t he know why they get these newspapers? The ads in newspapers aren’t available online, either – and political ads by groups like the Working Families Party are ones that the MTA’s media relations team should respond to regularly. Perhaps Mocker has a point about the Village Voice, which the MTA pays for a subscription despite its availability on the street for free. But then again, if a homeless man takes an entire stack of the free paper for bedding or urinates in the box at the newsstand, are we to expect an MTA employee to run around the city looking for the paper on the taxpayers’ dime? That would probably rile up WPIX enough to air a shrill expose, too. Secondly, isn’t it the job of the MTA chairman to stay informed about what the public is saying about his agency? Chairman Jay Walder reads the newspapers on the way to work each morning so he can respond accordingly. He also receives the Washington Post, a crucial tool for monitoring news about Federal funding for transit, which could save the state millions upon millions of dollars and potentially save transit riders from damaging service cuts and fare hikes. Does Mocker really think this is unnecessary? Probably not, but it gave him and WPIX another opportunity to play the role of populist hero by misinforming the masses. What’s missing more than anything else from this story is perspective. For one thing, even Mocker himself admits that the MTA cut their newspaper subscription costs by 80% three years ago – a fact that would indicate that in Jay Walder’s successful bid to cut waste out of the MTA’s budget, he saw no need to cut further in this area. But what’s entirely omitted from the story is a mention of the size of the MTA’s budget deficit: $800 million. If Greg Mocker and WPIX aired this hit piece to sucker the MTA into cutting these subscriptions entirely, that would bring the MTA 0.000013% closer to fiscal solvency. Congratulations, WPIX! Only another 99.999987% to go! Chris O'Leary is a transportation geek who has been reading and drawing maps since the age of 3. He thinks he knows far more than he does, but shares his somewhat informed opinions about mass transit, roads, and urban design here. He was born in Rhode Island and lives in New York City. He hates writing about himself in the third person. He also writes about craft beer at Brew York, New York. You can e-mail him at ontransport [at] gmail.com.